As 2015 comes to a close and we look back on everything that happened throughout the last 12 months, we have to say: we couldn't be more honored and excited to have been able to partner with some pretty awesome people! We'd love to share some of our favorite moments from 2015 with you, and send a big thank you to each and every person who's been involved with frego through it all. And, an especially special thank you to all you fantastic frego fans! We always love chatting with you, and without your love and support for frego we wouldn't exist! For those of you who are new here – Welcome! We can't wait to chat with you too! Did you catch frego's TV debut? For the second time, our containers were chosen to be featured on DIY Network's program, 'I Want That' and we had a great time watching frego turn into a TV star – not to mention learning about some other pretty neat products out there! frego made many new awesome friends this year on Twitter and one of them was the uber creative Lunchbox Dad. (From a Star Wars or Nightmare Before Christmas theme to any holiday or season theme, he has a super fun and unique take on packing school lunches that you have to check out! Not only have we enjoyed our interactions with him, we were happy to be included in his post, Lunchbox Dad's 2015 Back to School Guide, where he says, "frego's design is actually pretty creative. ... So it protects you while you handle it but also provides a cushion if dropped. How has nobody thought of this before? C'mon lunchbox engineers, time to innovate!" Thanks, Beau! The Grommet's "Makers Who Made It: 100 Stories of Starting a Business"
After seven years of helping Makers launch their undiscovered products to the masses, The Grommet is sharing their community’s wisdom and insights to help inspire others through their free ebook, Makers Who Made It: 100 Stories of Starting a Business. The book includes interviews from Makers, inventors, and entrepreneurs and our founder, Juhi, was chosen as an innovative Maker and shares her journey as an entrepreneur in her interview with The Grommet's co-founders, Jules Pieri and Joanne Domeniconi. Whether you're an entrepreneur yourself or interested in the making of frego itself, this is a definite must-read! In Glamour Magazine's article, Found: The Perfect Food Storage Containers (BPA-Free, and They Help You Control Portions Too), Marissa Gold shares her experience with, and thoughts on, our eco-friendly containers she discover on a trip to the Container Store. We loved reading her say, "Anyone prepping her own food needs a solid container collection, and these are perfectly sized, chemical-free, and super-easy to clean as well." We're so happy to learn how pleased you were to join the frego revolution, Melissa! It's always fun to see frego in print too! So naturally we were honored to have been chosen, among other great healthy-eating products on their radar, to be featured in Experience L!fe's 'Our Favorites: July/August 2015 Healthy Eating Products' article in the Worthy Goods' section of their August 2015 issue. Pretty neat if we do say so ourselves! The Lunchbox Fund is an organization we hold near and dear to our hearts. They are a non-profit organization that focuses on fostering education, via nutrition, by providing a daily meal for orphaned and at-risk school children in township and rural areas of South Africa. Their mission is something we are also passionate about, which is why we were proud to partner with them to donate 1% of our sales to help support them in their fight to end hunger and malnutrition in children. Now, enough about us... it's your turn! 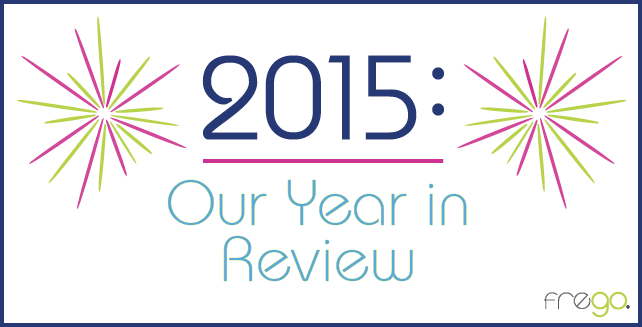 Take a few minutes to reflect on your past year and the exciting and awesome things you were part of and then come on over to Twitter to tell us: What was the most memorable moment for YOU in 2015? ?